I finally tried the latest spinning craze – SoulCycle. I’m sure you’ve heard of it, because it really has swept the country. People love SoulCycle. And when they offered Marine Corps Marathon finishers a free class just for showing our bibs, I (and some of my runner buddies) had to take advantage of it. Curious about what I thought? 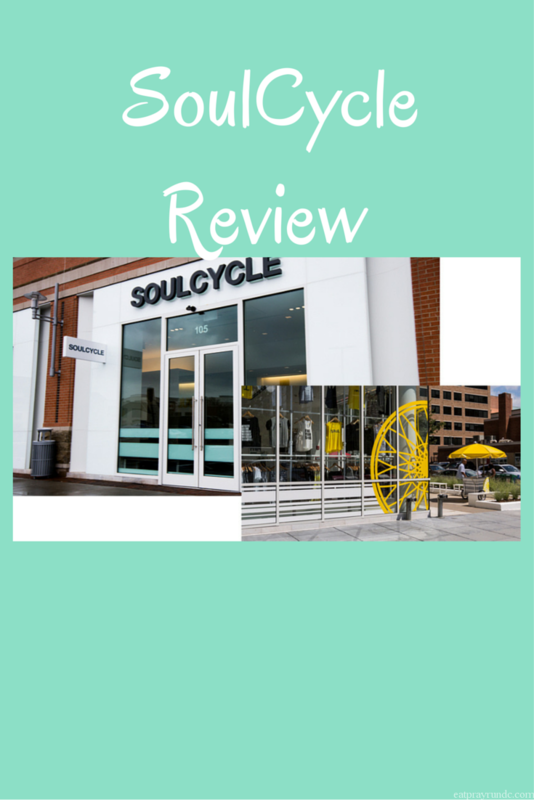 Read on for my SoulCycle review. I’ve always enjoyed spinning classes and so I was pumped to finally try SoulCycle. I signed up for a crack of dawn 6am class and grabbed my marathon bib and headed to the studio. In DC, there are a few locations and I checked out the Mt. Vernon Square studio. It was bright and white with encouraging quotes on the walls and a friendly staff. While SoulCycle is expensive ($30/a class or a bit less if you buy a package), it includes the clip in shoes that are required (some other studios make you pay $3 to rent them. The staff was super friendly as I mentioned – I walked in, checked in and was given my clip in shoes. I threw my stuff in a locker (with a built in coding system – thank you!) and then filled my water bottle and headed into class. You reserve your bike online when you sign up and although the room is darkened, it wasn’t hard for my buddy and I to find our bikes. I really liked the fact that SoulCycle had staff members in the room, making sure folks got set up properly. It’s really important that your bike be set up properly and I hate feeling awkward in a new studio, trying to figure everything out. Their helpful staff got us all set up and before we knew it, class was starting. Our instructor used upbeat, pulsating music that you typically find in a spin class. I found the class pretty similar to other spin classes I’ve been to, with one difference. The other riders in the class appeared to be SoulCycle devotees and their energy really pumped me up. It’s one thing to have a great instructor (which we did), but to be spinning with a room full of people who are really into what they are doing is inspiring. I appreciated the weight work as well but that’s something that almost every spin studio does, so I wouldn’t call it a stand out aspect. Before we knew it, the class was over (it’s 45 minutes long, which is a bit shorter than most spin studios I’ve been to) and we were sweaty monsters, dripping all over the bikes. Oh, one final note: I appreciated that the staff came right in to clean the bikes and that we didn’t have to worry about that. It also made me feel better about the cleanliness of the studio. Overall, I enjoyed my SoulCycle experience and would definitely go back for another class. The instructor, the friendly staff (this one is a MUST for me with fitness studios and it’s part of the reason I love Pure Barre so much) and the motivated other riders are all a plus. Of the studios I’ve visited in the area (Biker Barre, Off Road Fitness, Mint, Revolve, Sculpt DC, and probably more I’m forgetting), I would rate SoulCycle up there in my top 3. Have you tried SoulCycle yet? What’d you think? I did a double take when I saw this post title in my feed this morning because I drafted my SoulCycle review last night – but scheduled it for later. 🙂 I’m glad I saw what all the hype was about, but it’s not my favorite style. I love cycle classes and have been spinning for years. I have done a few Soul Cycle classes and they are not my fave. Agree that they are shorter than most. I felt like the classes I tried were cult like, very crowded and I couldn’t hear what the instructor was saying to do regarding resistance and pace. Cycling is a great workout though! my class wasn’t too crowded either (thank goodness) though I did think the bikes were too close together. Awesome workout but definitely not my favorite spin studio in the area! We don’t have Soul Cycle here but it sounds like a fun workout and it’s great you got to try it for free (especially since the regular price is a bit expensive). It sounds very clean which is something I like, as I don’t trust workout class participants clean the equipment, maps, bikes, etc. I’ve heard so many great things about Soul Cycle, but I’m just not a huge fan of cycling–I’ve tried spin classes in the past and just can’t get into them. However, there’s a Pure Barre studio right by me on Capitol Hill I’ve been meaning to try! Jen@bubblyrunner.com recently posted…Thanksgiving & Weekend Wrap-Up! That’s my home Pure Barre studio! You should definitely go – and say hi if you see me there!!! Haha, it’s definitely a great workout!! Not sure how I missed that MCM’ers could get a free class?! Wonder if they will still honor that? I would love to try and awesome that it’s in your top 3! Definitely need to check it out! I think it was only for a couple weeks after the race 🙁 I follow them on FB so I saw their ad there. But I think they do a highly discounted first class. Let me know if you go because I have a free class I still need to use! Have you tried Zengo Cycle? My husband loves Zengo and I have gone a few times, and it sounds really similar… but it’s less expensive. It’s also a little more conveniently located for us. Neither of us have tried Soul Cycle, though, so I don’t know if it’s somehow better. I tried Pure Barre recently and wasn’t that into it. I found it to be very similar to the Bar Method, in all the ways I didn’t like. I love Xtend Barre, though (or, I did in California – I haven’t tried the Alexandria one yet), and I just bought a starter 3-pack from Barre3, so I’m excited to try that out! I’m glad I tried Soul Cycle as well, but not my fave of the local cycling spots. The ladies recommended a few other instructors so I may try one more, but I prefer classes with monitors on the bikes (to calculate the distance) and the playlist was so so (techoy house music).